The Lands of the Linnorm Kings derive its name from its leaders, each of who can rule after slaying one of the massive, draconic linnorms that inhabit the region. Centuries ago, when a warrior set out to slay a dragon of her own and carve out a kingdom, she returned not with a linnorm's head but that of the local linnorm king. The lone witness insisted she had used ice magic and Irriseni witchcraft to kill the king, an accusation that led to the warrior's execution. It's said that even today, the so-called Jarlsblood Witch prowls the land and snatches up lone travelers. Not all believe these tales, most notably the warrior's descendants. One serves as a member of Taldor's Ulfen Guard and has contacted the Society to make a deal: exonerate his defamed ancestor in exchange for intelligence that could shape Taldor's future and avert a disaster. It's up to the PCs to embark into the frozen Lands of the Linnorm Kings to solve an ancient murder mystery, though there's far more at stake than honor. 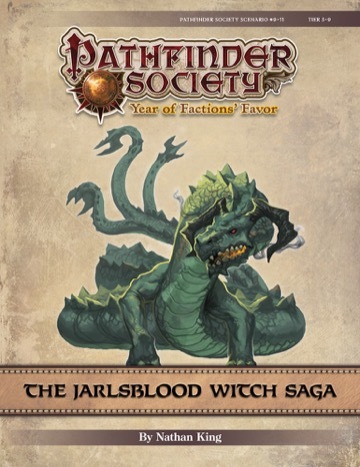 Contents in The Jarlsblood Witch Saga also contribute directly to the ongoing storyline of the Sovereign Court faction. This is one of several scenarios that also set the stage for and directly tie into the upcoming War for the Crown Adventure Path. put me in as overflow, but if i remember my schedule i will be available.